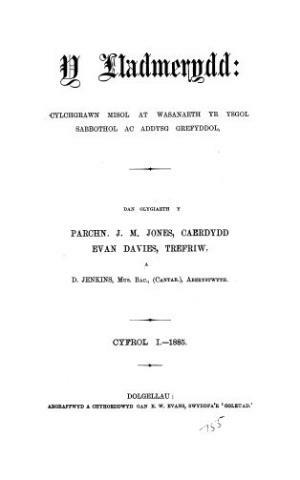 A monthly Welsh language religious periodical intended for the Sunday schools of the Calvinist Methodists. The periodical's main contents were religious articles, Sunday school lessons, reports on the Sunday schools' activities, poetry and music. Amongst the periodical's editors were the ministers Evan Davies (1842-1919), John Morgan Jones (1838-1921) and William Nantlais Williams (1874-1959), with the musicians David Jenkins (1848-1915), between 1885 and 1915, and subsequently David Evans (1874-1948) serving as music editors. Associated titles: Yr Efengylydd (1926).